Sydney: The tri-series one-day international between Australia and India was abandoned Monday due to rain. The washout at the Sydney Cricket Ground on the Australia Day national holiday meant both Australia and India took two points from the match. Australia had already qualified for the final in Perth on Sunday and India's windfall meant they stayed alive in the series: the winner of their round-robin match against England on Friday will claim the other finals place. After being sent in to bat, India were 69 for two off 16 overs when the match was called off. The start of the game delayed due to a slight morning drizzle. India lost Shikhar Dhawan soon after the game resumed. The left-hander who is going through tough time with the bat could not stop his fall and was dismissed by Mitchell Starc in the seventh over. Ajinkya Rahane and Ambati Rayudu then steadied Indian innings as the team brought up its fifty in the 11th over of the innings. While the Mumbai right-hander was watchful in his approach, Rayudu was aggressive tackling the Australian attack. However, the hosts cut short Rayudu's stay in the middle as Warner took a fine catch running backwards off Mitchell Marsh's bowling to give Australia their second breakthrough. The rain then struck back to halt game once again. With the raingods refusing to be kind towards the game of cricket, Australian team members enjoyed their time playing cards and crossword in the dressing room. Earlier, Australian skipper George Bailey won the toss and elected to field. However, the game was stopped due to rain after 2.4 overs with Indian openers Rahane and Dhawan scoring 6 runs. For this game, India brought in Ravindra Jadeja & Ishant Sharma in place Ravichandran Ashwin and Bhuvneshwar Kumar. Here are the playing XIs. 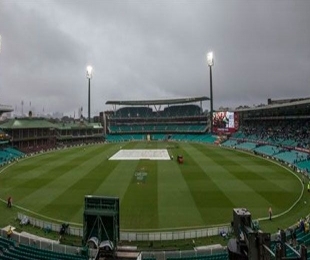 Rain delayed the toss and revised the playing conditions at the Sydney Cricket Ground.